The aorta, the largest blood vessel in the body, emerges from the heart in an upward direction before bending backwards and downwards to supply the lower parts of the body. This curvature, known as the aortic arch, also gives off branches that supply the brain and arms. When the walls of the aortic arch dilate and widen (causing an aneurysm), or when a tear appears (aortic dissection), surgical or medical intervention is required, as severe internal bleeding can occur. Risk factors for aortic aneurysms include hardening of arteries (atherosclerosis), high blood pressure, some genetic conditions (such as Marfan’s Syndrome), tissue pathologies which weaken the aortic wall, or trauma. Aneurysms along the aortic arch often develop slowly over many years with little or no symptoms, and are usually detected when medical imaging is conducted for unrelated reasons. Some patients experience chest pain, fast pulse, fatigue or shortness of breath. There may also be a marked difference in blood pressure measured in the arms and legs. Should these symptoms occur, it is important to seek urgent medical attention, particularly to rule out aortic dissection, which is life-threatening and demands immediate surgery. Surgery is required when the aneurysm has reached a certain size, when it is ruptured, or when aortic dissection is detected. 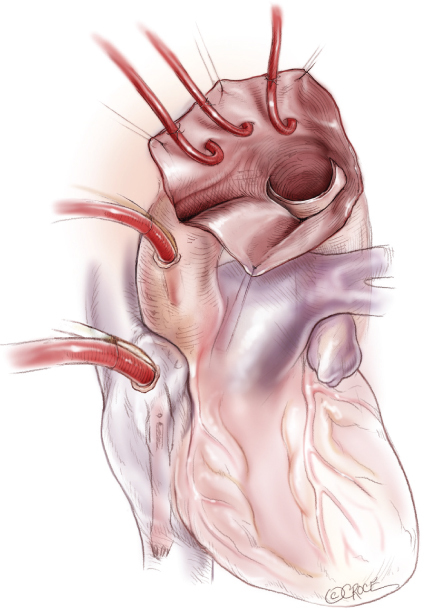 Aortic arch surgery is a highly complex operation. It requires heart-lung bypass, whereby after opening the chest, circulation is diverted from the heart and lungs and oxygenated blood is pumped around the body using an external machine. The heart then stops beating. Subsequently, the body is cooled down to around 18-28 ℃ (64-82 ℉), which reduces the metabolic demands of vital organs, allowing general circulation around the body to be stopped (circulatory arrest). Concurrently, blood is selectively pumped to the brain via arteries to maintain neurological function. Operation on the aortic arch is then performed, which is usually replacement of diseased portions with synthetic material. Once all the blood vessels are satisfactorily replaced and connected, the blood is slowly warmed and introduced into the body, and the heart restarted. During this operation, repairs can also be performed for any concomitant heart anomalies, such as blocked coronary arteries. Depending on the nature of the aortic aneurysm, an endovascular approach, whereby a metal wire mesh (stent)is inserted via an artery to stabilise the aneurysm, can be utilised. This minimally-invasive procedure removes the need for open heart surgery in some select cases.